Old magazines with articles I had written dating back to 1996. Thirty-six inch vinyl posters of book covers beginning in 1999. A 3-foot lighthouse used in a teaching on motherhood. A treasure box of oyster shells mixed with a strand of pearls used in another teaching on what can happen with irritations that get under our skin. Videos of past interviews from television programs that probably don’t even exist any longer. The programs played through my mind as I dumped one storage bin after another into plastic bags—pieces of my life into black drawstring Hefties. Corners of posters, magazines, cassettes, note-filled binders, and CDs poked through the plastic bags as if trying to escape. Twenty years. Ten trash bags. I put the bags out by the street and pondered my day’s work. You’d think I would have been happy to have cleaned out all that clutter, but something inside me ached. “So that’s it then,” I whispered as I walked away from twenty years of accumulated memories. The next day my heart felt just about as empty as the newly cleaned shelves…until I opened my email. A word of encouragement waited for me in my inbox. A woman told me about how something I had written had given her the courage to face another day. I won’t go into the details, but her email opened my eyes and my heart to something I already knew, but had forgotten for just a moment. Those ten trash bags didn’t contain twenty years of ministry or memories. Why? Because memories can’t be put in a trash bag. Because people’s lives can’t be put in a trash bag. 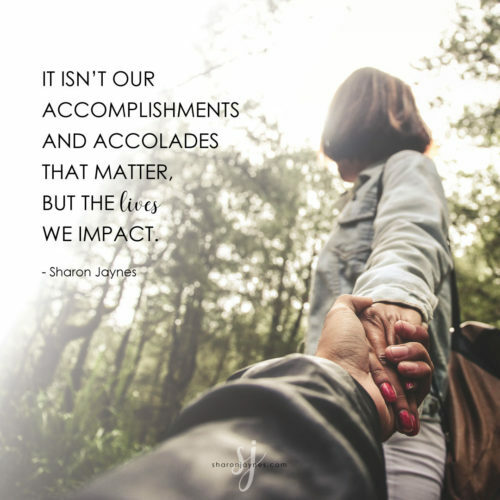 It isn’t our accomplishments and accolades that matter in this life, but the people we impact and the lives we’ve loved. Click & Tweet! And you can’t put that in a trash bag. Who is someone who has touched your life in a powerful way? Leave a comment and let’s celebrate the people who have shaped our lives for good. These moments of God speaking to me in the middle of the mundane is what I call a sudden glory—when God makes his presence known. Sudden glory moments shouldn’t be rare in our lives, but daily occurrences. 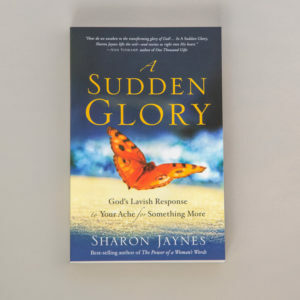 If you would like to learn more about how to experience God’s presence in your everyday life, then A Sudden Glory: God’s Lavish Response to Your Ache for Something More is just for you. It also comes with a study guide in the back. Also, for a limited time, I have newly designed CUFF BRACELETS from the women of Fashion and Compassion. 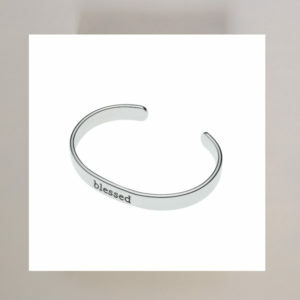 Wear them as a reminder that you are love, blessed, and strong, and help give dignity to women at risk at the same time. Click here to learn more. This is so true, I’ve learned this lesson again too. As an empty nester my house has been an outlet to redo and filled with treasures. But recently I have had a water leak that turned my treasures into a mess. I’ve learned I don’t need much and my family seemed more relaxed and we’ve had wonderful moments together through the mess! I’m only concerned about today and I want God to use me to impact lives, not sit and stare at my treasures. Thank you for your ministry! A lady I worked with years ago. Mary Kennedy. When still in my addictions she would come and tell me to go back to church. Finally I listen, then an old boyfriend said lets visit my father for father’s Day, Well it was in that church that I learned how to have a relationship with the Lord. I have not looked back. Praise God from whom all blessings flow. My mom – always praying and we constantly speak over our business and pray. So nice to be able to have a conversation about God and his wisdom with my mom. I treasure this time! Thank you for this post. I’ve had a habit since I was a child of holding on to things because of the memories attached to them. It has made throwing things away difficult at times though I have gotten better at it. In about ten days it will be one year since my grandmother passed away. I’ve already found myself getting emotional a lot lately thinking about her. She was an amazing woman of God and touched my life in more ways than I could write here. She was elegant and graceful (no doubt, at least in part, to the classes she had taken in her youth). It still makes me feel good when people tell me I look like or remind them of her or her mother who passed on when I was a little girl. I recently visited my grandfather and thoroughly enjoyed going through her old pictures. She was always someone I looked up to and I hope I inspire others the same way someday. I’ve served in the children’s ministry for near 10 years. In the future, I hope to see the impact of my work on at least one of those precious life’s and I hope to be positive. I don’t know. But I know that you have impacted my life greatly. You have helped me to focus on Jesus and nothing else. Thank you!